The STB962 SAFT replacement battery provides peace of mind making it the right choice among Cordless Phone Batteries. The STB962 is made from the ground-up with first-rate materials. On top of that this battery is developed to match or beat the requirements set forth by the manufacturer. With a massive inventory and everyday low prices it's easy to see why BatteryTex.com is your go-to site for replacement batteries. 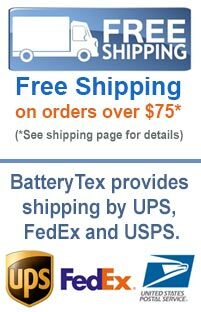 BatteryTex - your source for amazing prices on the best batteries on the market. Learn more about this item and get bulk pricing - call us now @ 1-888-825-6661. Browse or search our great inventory of Cordless Phone Batteries batteries here. To see our full inventory of batteries from this manufacturer click here. Batteries are judged on how strong they are, how long they last and how well they're built. Our batteries meet all of these qualifications and with amazing prices as well! Manufacturers supply the necessary warranties on batteries that we carry. Typical warranties are for 1 year while others change depending on the battery type and the maker.